Cubetape C190SHP parcel dimensioner works readily with any shipping software (e.g. UPS WorldShip, FedEx Ship Manager, ADSI Ship-It, etc.) to eliminate the manual data entry of length, width and height. Besides reducing the labor burden brought on by the carrier dimensional weight changes, the accuracy of Cubetape C190SHP parcel dimensioner eliminates the cost to your company of data entry errors. Cubetape also has value for LTL shipments since it can readily record the length, width and height of each pallet on a shipment. When printed on the Bill of Lading and signed by the driver, the dimensions can be valuable documentation to avoid post shipment billing adjustments by your carriers. 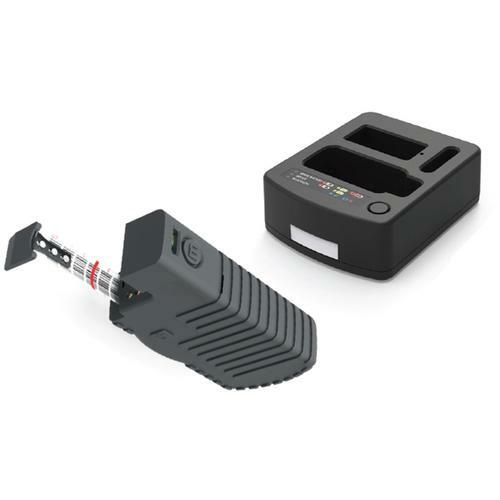 Small enough to fit into the palm of your hand, the Cubetape C190SHP parcel dimensioner can be used to quickly and accurately measure parcels and pallets at anytime, anywhere within 10 feet of the workstation. Data is transmitted via Bluetooth to the host system and scanner options are available. Requiring minimum operator training, the Cubetape C190SHP parcel dimensioner is used in the same way as a tape measure. Automatic data transfer and a user-friendly Human Machine Interface reduce human-error. Easy 2 minute install supports Worldship & FedEX ship manager. Designed for use in industrial environments, the Cubetape C190SHP parcel dimensioner is protected by a durable rubber cover. High quality electronics ensure accuracy and reliability over time replaceable pre certified tapes are available from your dealer. Your business needs a cost-effective solution for package measurement issues. Errors made in the manual data entry of length, width and height cause unexpected carrier chargebacks that affect your bottom line. The solution must be compact and work with your ShipRite software. It must to be easy to use, even for new and seasonal employees. You need a solution that is NTEP certified and virtually maintenance free. The right device will help streamline the counter experience of your customers and reduce costly errors because customer satisfaction and trust are priorities for your business. For your package measurement needs at the right price, Cubetape is your solution. It will be your barcode scanner, too. Cubetape is efficient and saves up to 15 seconds per package. Combined with the productivity of your e.g. UPS WorldShip, FedEx Ship Manager, ADSI Ship-It, etc. software, customer satisfaction is increased since transactions are handled more promptly. Cubetape is also a cordless barcode scanner. This means a single, compact device serves two important functions in your store. Cubetape is 100% compatible with e.g. UPS WorldShip, FedEx Ship Manager, ADSI Ship-It, etc. and works out of the box without programming changes. Cubetape is simple to use, requires very little training and is extremely reliable. There is virtually no preventive maintenance or cleaning required. The Barcodes on Tape (BoT) measuring cassette is easily replaced without tools and lasts 3 months + under expected usage. At about the cost of an electronic scale, Cubetape is both affordable and cost-effective. The cradle connects to your PC with an included USB cable. Cubetape connects via Bluetooth to the cradle by simply scanning a barcode on the cradle. Data from barcode scans and measurements is sent instantaneously from Cubetape to the cradle and into your ShipRite software. Cubetape is NTEP approved for "legal for trade" use. It can confidently be used in your retail shipping store. 140mm x 76mm x 31mm 5.5" x 3" x 1.5" x 1.25"
127mm x 102 mm x 64mm/5" x 4" x 2.5"